It is this moment that you as a reader will expect the author to capitalize upon. . . some grand realization that Flora indeed loves her brother and wants to keep him. Instead, her response is simply that her mother wouldn’t like it if she lost him. This moment is a little disappointing. HOWEVER, I overall truly enjoyed the creative portrayal of Flora gradually realizing her love for Crispin. Some may argue that the message requires too much reading between the lines. Personally, I believe good stories act out the message instead of preach the message. Obvious is not always the best. The story closes with a picture of Flora sharing cookies with her brother. She then scoots over to him and puts her arm around him. Pictures speak louder than words and I believe the message rings loud and clear. Great book! One final note: these illustrations couldn’t be more perfect. Amazing job by Matt Phelan! Categories: Lesley's Book Review | Tags: Children's Book Review, Sibling Relationship | Permalink. Simple. Imaginative. Educational. Fun rhythm. Smooth rhyme. All the qualities of a great board book! I at times feel that either the illustrative, educational, or linguistic artistry is sacrificed in board books, since writing for the itty-bitty readers can be oversimplified. Not so with this book. Audrey Wood really delivers a classic. My only warning is that many may buy this board book version, not realizing that it is an abridged version. There is a longer version that can be enjoyed even more fully. Categories: Lesley's Book Review | Tags: Character Development Books, Children's Book Review, Rhyme | Permalink. It’s never too early to reinforce a healthy body image in our children. Though most of this should be taught through proper affection and modeling through the parents, books can also serve as wonderful supplements to any life lesson. In this case, “Wild About Us!” is the perfect fit for young children. In fun and simple rhyme, Karen Beaumont introduces us to Warty Warthog, who happens to be very proud of his appearance. As he puts it, “can’t be who I’m not. I am who I am, and I’ve got what I’ve got.” The other animals at the zoo share the same sentiment. No one seems to worry about whether their ears stick out or whether their nose is too long. Wrinkly skin isn’t worrisome either, nor big feet . . . not even a hind-end that packs a bit of jiggle. They each appreciate their differences and accept how they’ve been made. “We’re glad we’re all different! If you came to the zoo . . . So true! A 5-Star book for two to 10-year-olds! Categories: Lesley's Book Review | Tags: Body Image, Character, Children's Book Review, zoo | Permalink. Dawn Casey and Charles Fuge join forces in this tale of father-child bonding. It is evening and Big Daddy Rabbit invites his Little One along for some purely sweet frolicking – chasing each other though the woods, playing hide-and-seek, dancing and splashing. They are joined throughout the story by an owl, a mouse, and a very friendly bear. Each page-turn is a delight, filled with bright and beautiful color. There is no shortage of character cuteness. The story rides a light-hearted high until it is interrupted by a sudden whimper. As with most little ones, the excitement can quickly end when all energy is spent and bedtime calls. “Are you all worn out from that hullaballo?” asks the father. “Maybe it’s time for a lullaballoo.” A rose and yellow watercolor sunset spreads atop the page as Big Rabbit carries his Little One away and their friends wave goodnight. We are left with a sense of completion and comfort seeing these two furry creatures snuggle together for some sweet dreams, making it a wonderful bedtime book for us to settle into a snuggle with our own little ones. These illustrations are fantastic, and I believe a child of any age would enjoy looking through this book. Fuge brings great expression and feeling to the story. The text, also, has the potential for added dramatic expression, using words that may tickle the ears of young children – whooped and swooped, splashed and sploshed, and snuffled and snuggled. The storyline is short and in a very simple rhyme, setting the ideal audience target to a younger crowd of around two to five years old. Categories: Lesley's Book Review | Tags: Bedtime, Children's Book Review, Friendship, Rabbits, Relationship, Rhyme, Summer Books | Permalink. It’s difficult to decide which pet is the best, especially when it’s a comparison of dinosaur pets. In this story a young boy happened upon a Dino Pets store, and so begins the plot: “I got a dino for a pet, the BIGGEST dino I could get.” One can imagine the problems about to arise, so it is not surprising when the boy needs to change his choice of pet. As it turns out, dino pets of any kind have their own set of complications. After trying the fastest, lo-o-ongest , softest, smallest, and scariest dinosaur, it seemed that his pet search would only end in disappointment. But not so! You’ll have to read it to see. Kids enjoy the wonder of dinosaurs and this book both inspires imagination and develops reason. For instance, what would it actually be like if the longest dinosaur was at the playground? Imagining the possibilities and reasoning the probabilities are both at play in this book. Lynn Plourde writes in simple rhyme, great for literary development and memorization. Though there are a few stumbles in the rhythm, the overall idea and flow are fun and upbeat, ideal for animated storytelling that will excite our little readers. Gideon Kendall’s illustrations are a real pleasure, with bold colors and humorous expressions throughout that will draw the reader into the story. Get it and get ready for some dramatic storytelling! If you found this recommendation helpful, I’d love your feedback! You can rate my review as helpful by following this AMAZON LINK. Or, by following this GOODREADS LINK. To find other children’s books recommended by Lesley, simply Click Here! Categories: Lesley's Book Review | Tags: Children's Book Review, Dinosaurs, Pets | Permalink. Here is a book for all the cat-lovers out there! 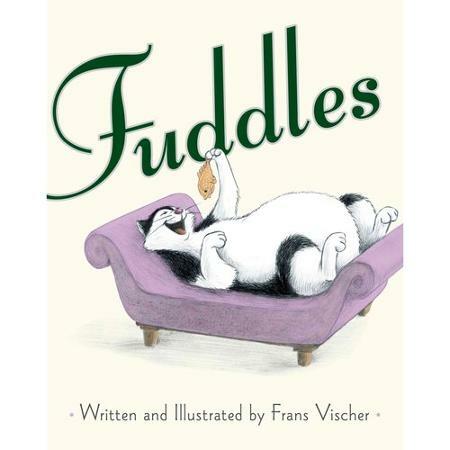 Fuddles is a fat and pampered cat who lives the good life indoors. He seemed completely satisfied, until one day he gets it in his mind that a grand adventure awaits him beyond the front door and into the “wild.” The comforts of home are no longer as appealing as the excitements of the unknown. He attempts to prepare for his outdoor exploit as best he can, but when his chance for escape finally comes, his main discovery is just how unprepared he still is . . . and when actual danger ushers him further away from home than he can navigate, he gains a new appreciation for home and family. In the end, Fuddles is finally found, as is his sense of where he belongs. He’s an adventurer that happens to love being pampered! This book was my introduction to Frans Vischer, who is both author and illustrator. This rare talent combination is dynamite, since much of the fun in picture books is the interplay between what should be spoken with words and what the illustrations can reveal to us “between the lines.” In this case, there is an endearing storyline with a perfectly subtle, yet sure, message of family and belonging. The illustrations take it to a whole new level, adding humor and emotion, and reminding us readers not to take our own blessings for granted. One of those blessings might be a fat, pampered cat on your lap awaiting a soft belly rub, just like in the final, adorable illustration. 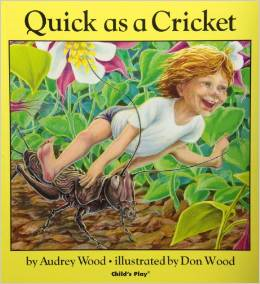 Recommended for ages 4 to 8! Categories: Lesley's Book Review | Tags: Cats, Children's Book Review | Permalink.